On the monthly chart, Euro is moving inside a wide consolidation channel. The first descending wave was marked as crisis. Right now, the market is forming another descending wave. 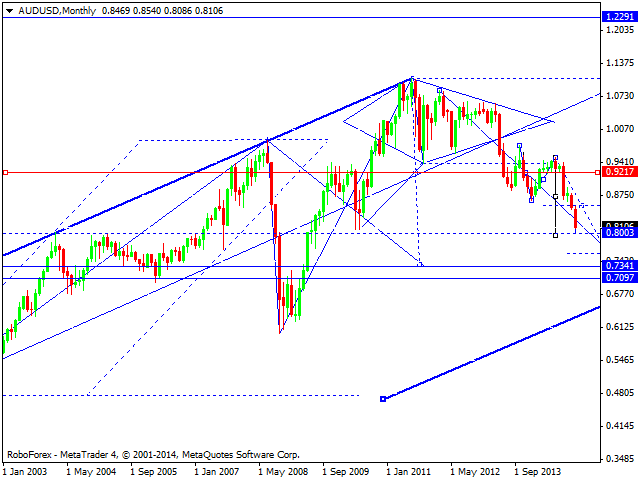 If the price breaks Triangle pattern downwards, the decline may become catastrophic and reach level of 0.9600. And if this descending movement continues without any corrections and reached level of 1.1000, it may continue towards level of 0.5000. This descending movement will be considered as the third wave of the downtrend, and the crisis may only make it worse. So far, we should note that the pair is forming the first descending structure with the target at level of 1.1000. 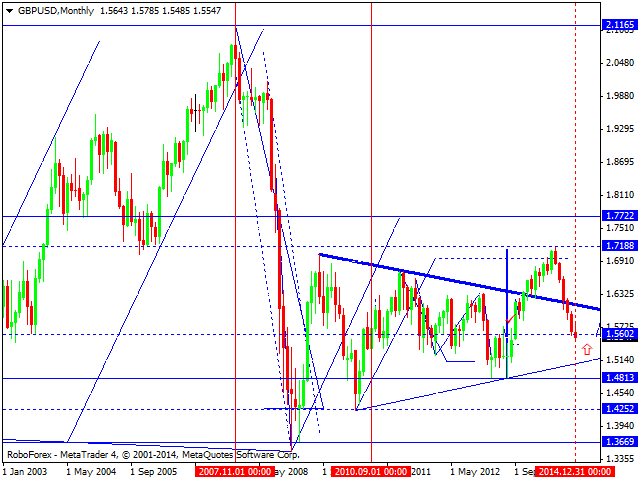 On the monthly chart, pound is forming a descending structure, which so far may considered as a correctional one. The market has return to the center of Triangle pattern broken upwards earlier and may yet continue growing. The price is expected to move according to the “optimistic” scenario and reach level of 1.7700. 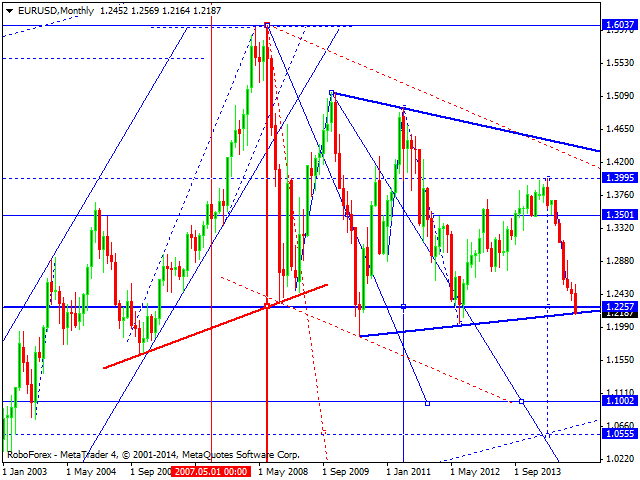 Only if the global world crisis continues, the pair may continue falling towards the target at 1.4250. On the monthly chart, Franc is growing towards the target at 1.0000. After reaching it, the price may fall towards level of 0.9360 at least, or even 0.8780. If this scenario is confirmed, the US Dollar will continue to strengthen against other currencies and the target for Franc will be at level of 1.1474. On the monthly chart, Yen has completed the structure to return to level of 97.00, formed an upside continuation pattern, extended this ascending wave, and reached the next target. Now the price is expected to return to level of 97.00 to test it from above (at least). During the next several weeks, the market is expected to form a consolidation channel and a reversal pattern at the top of this structure. 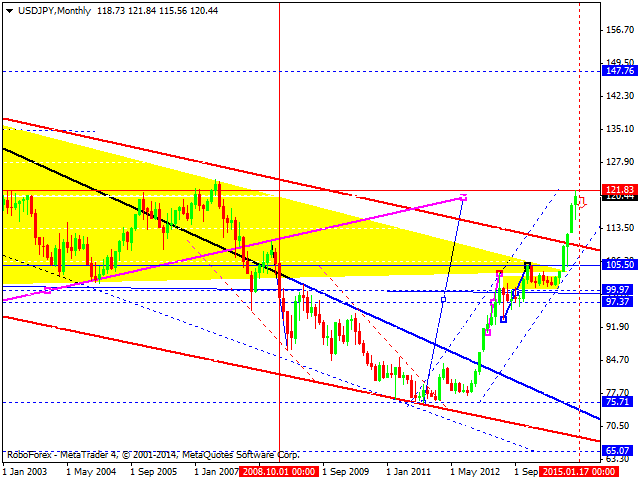 After breaking the ascending channel, the pair may start a new correction with the target at level of 97.00 at least. 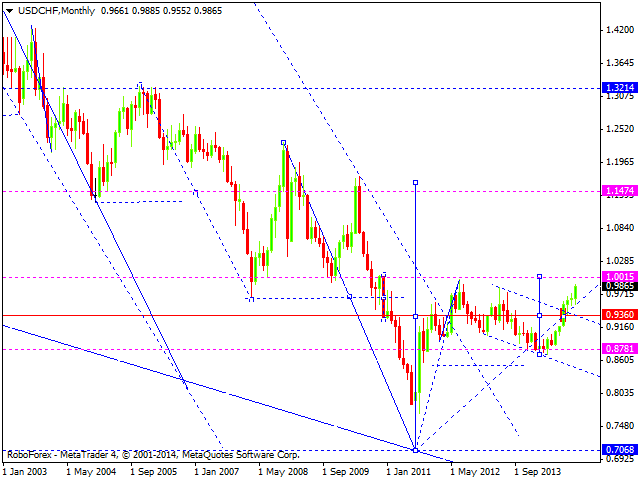 On the monthly chart, Australian Dollar is forming the third descending wave with the target at level of 0.7500. Right now, the price is forming the third structure of this wave towards level of 0.7800. after reaching it, the pair may start a new correction towards level of 0.8600 and the resume falling inside the downtrend to reach a local target. 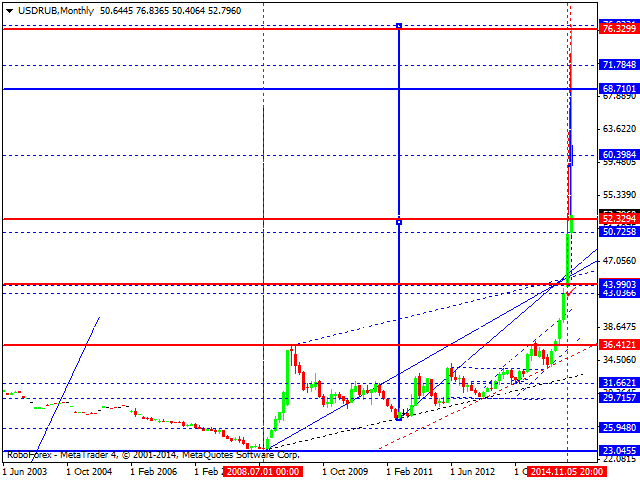 On the monthly chart, Ruble continues forming a descending wave with the target at level of 45.00. This target is a predicted one, so far. After reaching it, the market is expected to return to level of 60.00 and then start forming another descending wave with the target at level of 36.00. 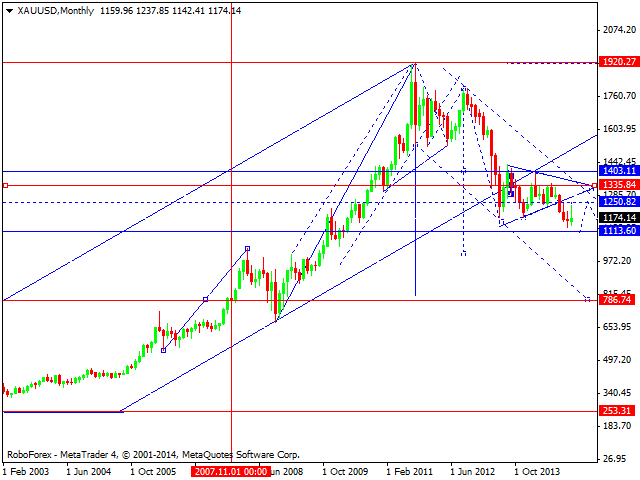 On the monthly chart, Gold has broken the ascending channel downwards and is forming a downside continuation pattern near level of 1250. At the moment, the market is expected to test level of 1250 from below and then continue falling to reach level of 1110. After that, the price may return to level of 1250 and then resume falling to reach level of 1070.